Kedarnath Disaster-‘A Scientific & Administrative Failure’ | Quest That Change…. 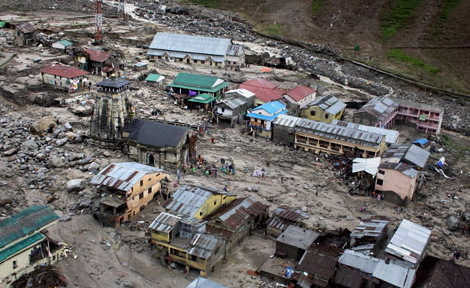 In various reports on Kedarnath disaster, it is said that unplanned development in Kedarnath city led to huge death toll. But, none of the scientific reports like from WIHG (Wadia Institute of Himalayan Geology, based in Dehradun, India) said that it was scientific failure as well, as they could not inform about slow and abrupt disintegration of ‘Glacial Mass’, increased and uneven ‘temperature’ pattern during June 2013, and huge ‘downpour’ starting from 14 June in the region, given that Wadia Institute has an observatory at Kedarnath. Similarly, the institutions like ICIMOD, based in Nepal, which is responsible for 8 regional countries including India, claims about its 4 hugely funded programmes since last 30 years, like; SERVIR-Himalaya a USAID funded programme with NASA, HKH-HYCOS a real time data sharing programme, Kailash Sacred initiative and HICAP for information sharing, but, nothing has came in ground till now in affected region. And, ultimately the administrative failure that led to thousands of death post disaster are known to us! What makes our governments and donors sustain or fund such agencies, those really are not capable of helping our communities through right kind of science and information sharing mechanism? I wonder!